Kira Greene’s paintings and drawings negotiate the duality and dichotomy of her existence as an Asian immigrant woman in America. As an outsider, Greene is more aware of the contradictions in the plurality of cultures in the present American society. As a feminist, she is repulsed and demoralized by the objectification of female bodies in art history and popular culture, yet she finds herself strongly attracted to sensuality of these images. This paradox has led her to combine the rigidity of patterns with the imagery of desire in the female body. 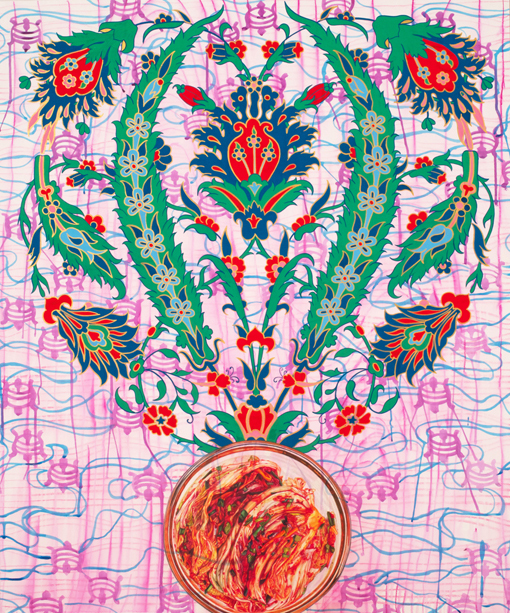 In her most recent work, she replaces the body with the images of lusciously styled food while heightening the complexity with the mixture of patterns and icons derived from various Western and Eastern sources. The food, both in harmony and clash with its surroundings, is the body (literally and metaphorically) and the surrogate for desire to consume and control. Greene earned her MFA from the School of Visual Arts in New York, a BFA from the San Francisco Art Institute, a Ph.D. in political science from Stanford University and a BA in International Relations from Seoul National University in Seoul, Korea. She has shown her work internationally at venues such as Accola Griefen Gallery (New York, NY), Diego Rivera Gallery (San Francisco, CA) Noyes Museum of Art (Oceanville, NJ ), Galeria Galou (San Juan, Puerto Rico) Piccolomini Palace (Pienza, Italy) and Sar House (Kowlon, Hong Kong). Her work has been covered in publications such as Wall Street International Magazine, Art21 Blog, Hyphen Magazine, The Korea Daily and New York Art Beat.